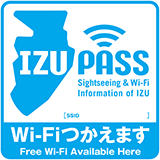 IZUPASS is the official portal site of the public free LAN project "Shizuoka Wi-Fi Paradise" promoted in the Izu region of Shizuoka Prefecture (Numazu, Mishima, Izunokuni, Izu). It is a Wi-Fi tourism site for inbound tourists (offered in 5 languages) to easily search on maps for free local government Wi-Fi spots in the Izu area and tourism information after landing. Free Wi-Fi that Izunokuni-shi sets up is the following SSID. Free Wi-Fi is available at notice point of sticker of upper figure. 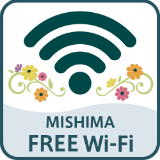 In Mishima-shi, we maintain free public wireless LAN (Wi-Fi) which is usable in the city for the purpose of convenience improvement of citizen and tourist from home and abroad. Free Wi-Fi to install of Mishima-shi is the following SSID. 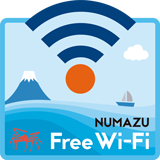 In Numazu-shi, we push forward maintenance of "NUMAZU FREE Wi-Fi" for tourist coming from citizen and the suburbs, foreign territory to provide comfortable information and communication environment. FREE Wi-Fi is service that customer can connect to the Internet free using information terminal (smartphone, tablet, PC) you have. We enlarge available FREE Wi-Fi environment casually and aim at improvement of convenience of customer. Free Wi-Fi to install of Numazu-shi is the following SSID.